Polishology: Are YOU a Good Witch? Are YOU a Good Witch? So sorry for the lack of posting for the last several days. My grandmother had a pretty big surgery on Monday and I have spent a lot of time at the hospital since then, as well as some other things going on... Thanks so much for not giving up on me! 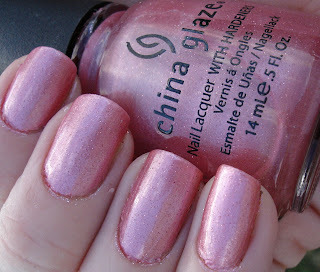 Today I have for you a mani that is somewhat in honor of BCA Month, because it is a fairly beautiful pink shade. Although I also honestly just wanted to wear it. This one has been on my want list for quite some time, and I finally got it, yay! To start off these nails, I used China Glaze Good Witch?, which is a really nice medium pink frost with pink microglitter throughout. 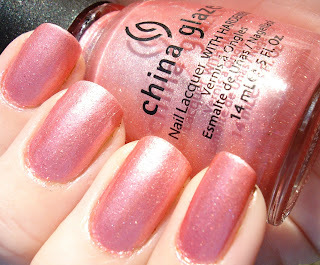 It is a really pretty color, but it is very sheer -this was four thin coats for full opacity. Dry time was very nice though, so it was not that much of a problem! 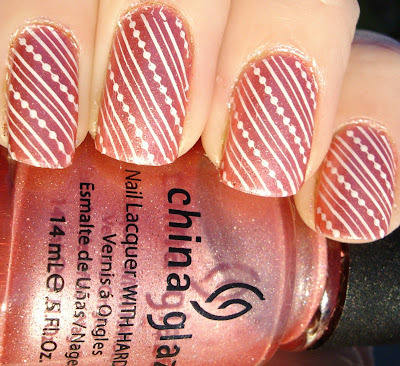 The finish was almost semi-matte, and just a bit bumpy, which I have read was an issue with this polish. However one coat of topcoat solved that problem. I then added the stripes using Konad plate m65 and Konad Special White. I topped it all off with a coat of Seche Vite! This has worn really well - I have been wearing it four days now (a combo of loving it and not having time to change my polish) and I have minimal tip wear and no chips. Below I have included some photos of Good Witch? by itself. It is really a stunning pink! So clean looking. I love it! Manhattan 610K Around the World! Are YOU Next? Jessica Funkytown Toes - And Kitty Pictures!